This week’s case is the result of Stacey Hrushowy bringing a unique jelly-like marine creature to my attention. Forgive the sensationalist blog title but truly, this animal is like the stuff of science fiction. It’s a 15 cm pulsing, translucent, rainbow-flashing blob that has a fascinating diet! Mystery creature (15 cm). Photo by Stacey Hrushowy. I’ve narrated a slideshow with video to share this with you. Please see below. I would not have been able to identify this species without Dave Wrobel and his site jellieszone.com . so informative Jackie! Thank you for all your time and effort in bringing us such fascinating stuff! Thank you Jac! You literally had a hand in this one!!!! So great to have you out there, equally fascinated when I found it. fantastic. really appreciate the narration jackie. thanks for the explantion regarding the difference between ‘jellies’. 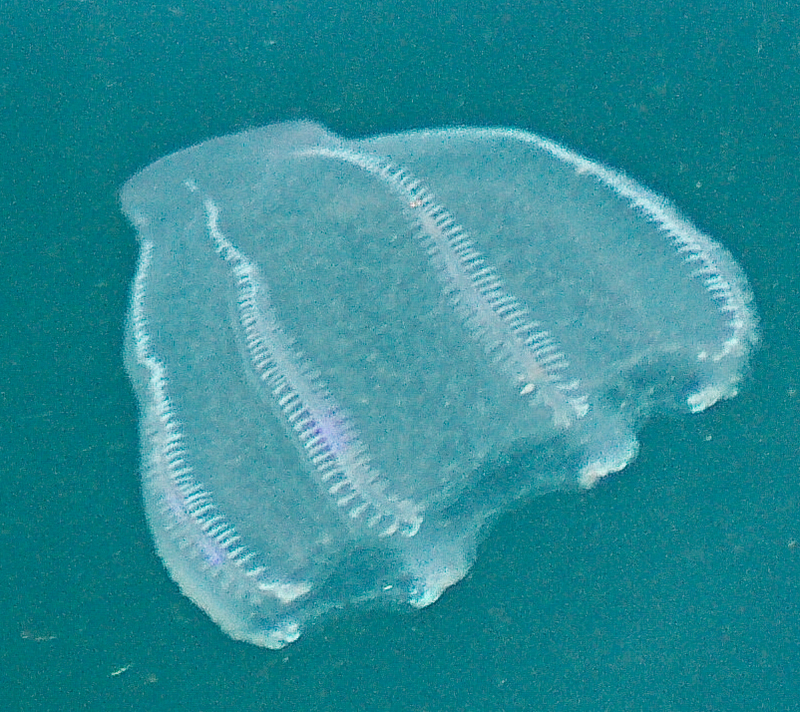 The last few years I’ve noticed more comb jellies in the water both in JS and furhter down in the Strait of Georgia. ps did i get here before jacqui??? So appreciate the nurturing feedback and love that you and Jac are racing to provide comments. Sorry, she won! I so know what you mean by the jelly tanks. I saw one at the Maui Ocean Centre and sat mesmerized. They are so surreal. Hello – I recently discovered one of these creatures (about 7 cm) swimming next to our floating dock in Fort Myers, Florida (February 2011). At first glance I thought it was a jellyfish. In the water where I spotted it there were thousands of small jellylike creatures that I can only describe as larvae-like. They looked like straight pins (about 2 cm) with a small blob of “jelly” at one end…maybe about the size of a head of a pin. That’s a bit of a vague description but do you have any idea what these could be? Are they comb jelly larvae? Would love to know if you figure it out.